The SBC’s continued pursuit of its prevalent flavor of theology – American Christianity – driven as it is by a seeker-sensitive model of church growth, finds its ERLC conference with one day under its belt. 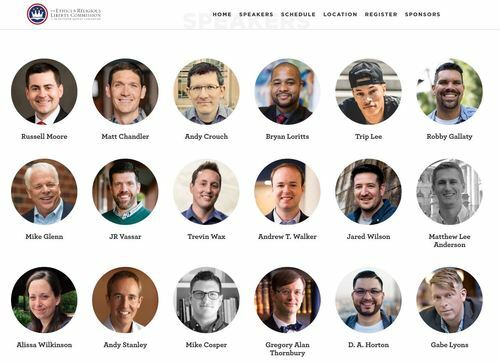 The two-day conference, August 25 & 26, was coincidentally (probably not) given the theme, Onward, also the title of Russell Moore’s recent book. The Ethics And Religious Liberty Commission conference includes a multitude of speakers, celebrity Christians, mega pastors, and even a poet. For the SBC, where doctrinal allegiance and Biblical authority are increasingly becoming mere theological terms reserved for the training halls of seminaries, it’s no surprise Scripture might be downplayed at a denominational conference. But for it to be outright denigrated might be an ignoble first, even for the SBC. The unfettered zeal to “engage the culture” can be interpreted, perhaps, as the convention’s superficial mantra to hide an underlying bureaucratic panic. The virulent hemorrhaging of members needs an emergency response team. Swing open the doors! Invite in the goats! Engage! Entertain! Retain! Onward! We don’t need no stinkin’ doctrine! So, day one of the conference allowed us to capture this little nugget of outright denial of Biblical authority. You may not have heard it so blatantly exclaimed from a Southern Baptist pulpit, but if you’re perceptive enough, you can discern it as underlying truth that drives the methodology of many SBC churches. It’s the “it’s all about you gospel” … and you don’t need much Bible for that … cuz it ain’t in the Bible! In playing the wildly favorite “What If You Were Pope” game with Andy Stanley, Russell Moore, President of the ERLC, posits the following question to the mega-church superstar pastor. Instead, Moore plays “what if you were God” with Stanley, using the apostate vicar of the Tiber as a colloquial reference to supreme ecclesiastic authority. Stanley, who you may remember has no affinity for expository preaching, has spoken negatively about small churches, and who encourages believers to bake gay wedding cakes, gave a few responses to Moore’s query. Perhaps it’s no Freudian slip – after all, greed is at the core of the false theology Stanley hurls forth – that he responds with a quick answer that is decidedly not from thinking on “things that are above.” (Colossians 3:2) Stanley’s first response, nobly couched though it is in a spiritualized ambition, reflects nothing short of his “show me the money” motivations. Yeah, sounds noble. But, don’t forget, those “churches” don’t belong to themselves, and certainly not to Andy, nor to church planters lacking facilities. Those churches belong to Christ. But, hey, if you’re Andy Stanley, it’s nothing to monetize the bride of Christ. He’s been doing it for years. When it’s all about the money, and not the bride of Christ, the lascivious looks at real estate are justifiable. Eight souls who faithfully worship? Forget them. Sell the building, get the cash. As though this response from Stanley wasn’t egregious enough – enough that it should have brought a rebuke – Moore allowed him to continue. Pause for a moment and let that answer stimulate your Biblically-informed synapses. “Get the spotlight off the Bible.” Really? Surely Moore injected a “wait just a minute there, fella” at this point, right? Wrong. Russell effected his impression of a bobblehead and let the Stanley blasphemy roll on. Which Jesus, Andy? The one that is only found in Scripture, HIS Word? The Scripture you want to toss by the wayside? That Jesus? Or a Jesus that you’ve imagined, one that will fill your pews … and your coffers? In other words, a false, idolatrous “Jesus” in whom faith is damning eternally, but full of tangible real estate options temporally? Somebody find Andy and show him these words of Christ … quickly, before he totally discards Scripture. While no audible shouts of “Amen” can be discerned from the audio, the lack of them doesn’t detract from Russell Moore’s amenable, head-nodding agreement with Stanley’s words. “Scripture’s inspired in terms of reaching this culture.” What’s that mean? Is cultural engagement the limit of Scripture’s authority? If so, what was all that “Feed my sheep” stuff about? Stanley’s hurling heresy here. But he doesn’t stop with this view of the limited authority of Scripture. He goes on. The two-minute video of this SBC tolerated, ERLC sponsored blasphemy against the Word of God is captured below. By the way … can you say … downgrade? *Editor’s Note: Pulpit & Pen called this in February, 2016. See here. Next story Podcast: What Can Women Do In Church?